One of the quirky things about working so far in advance is that sometimes I stumble across files I sort of forgot about. 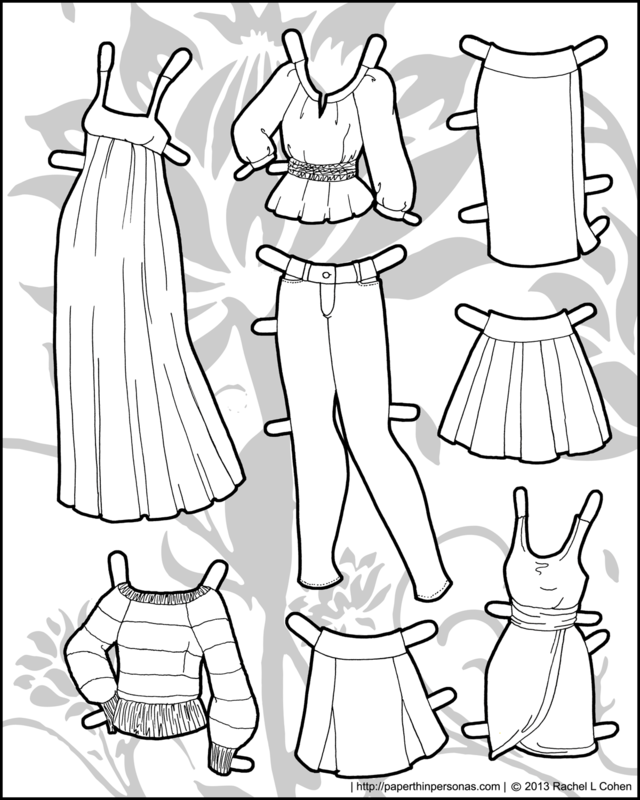 And today’s paper doll clothes post is one of those files. Opps. 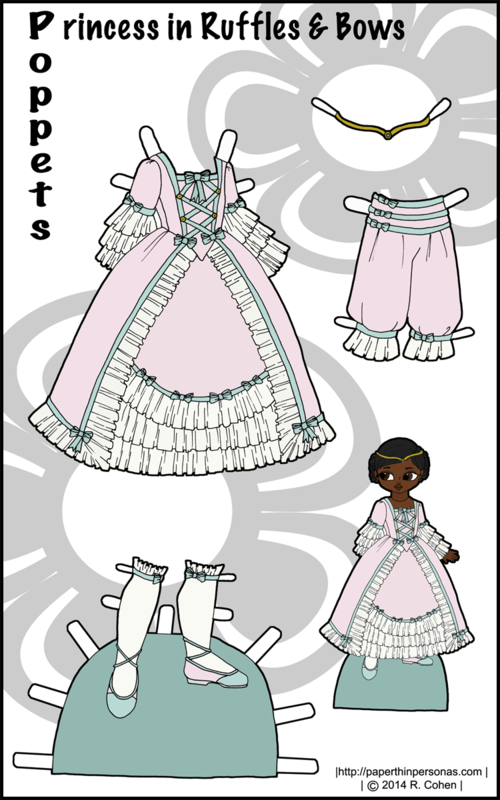 This set of paper doll clothing was completed last year for the Ms. Mannequin series and I actually thought I’d posted it, but when I was looking through my files, I realized I never had. After a few moment of, “Well, now I feel rather foolish…” I decided to put it up. After all, there’s no reason not to post it even if it’s a little old. When I had started this series I had decided to stick to a pretty small selection of colors designed to provide the most mix and match options for outfits, but in hind sight, I seem to recall getting pretty sick of the color options before the set was completed. Now you might be thinking, but where are some paper dolls who can wear these clothes? 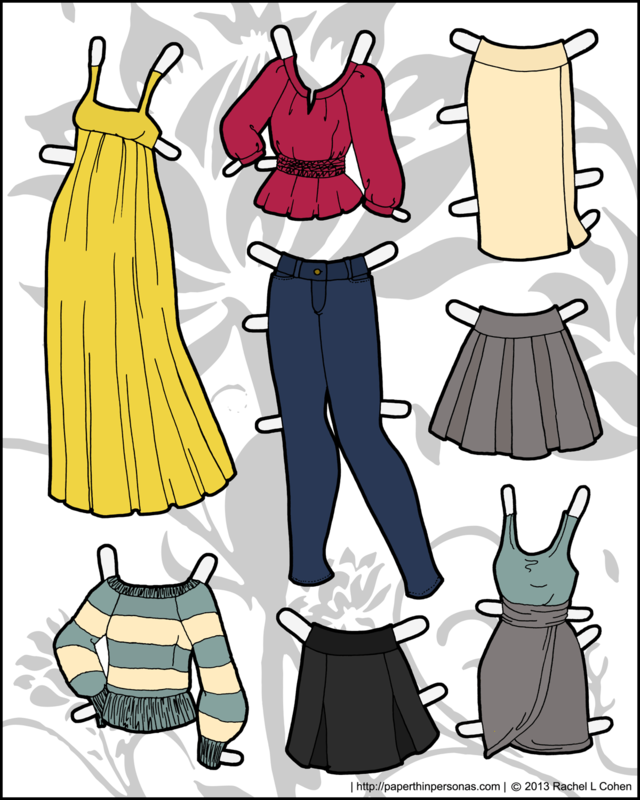 Any of the Ms. Mannequin paper dolls can wear any of these stylish clothing options. Personally, I’m a sucker for that yellow sundress. In my head, I imagine today’s paper doll as a companion to my Marauder princess paper doll from… wow, last year. That doesn’t seem so long ago. Time flies when you’re drawing paper dolls, I suppose. 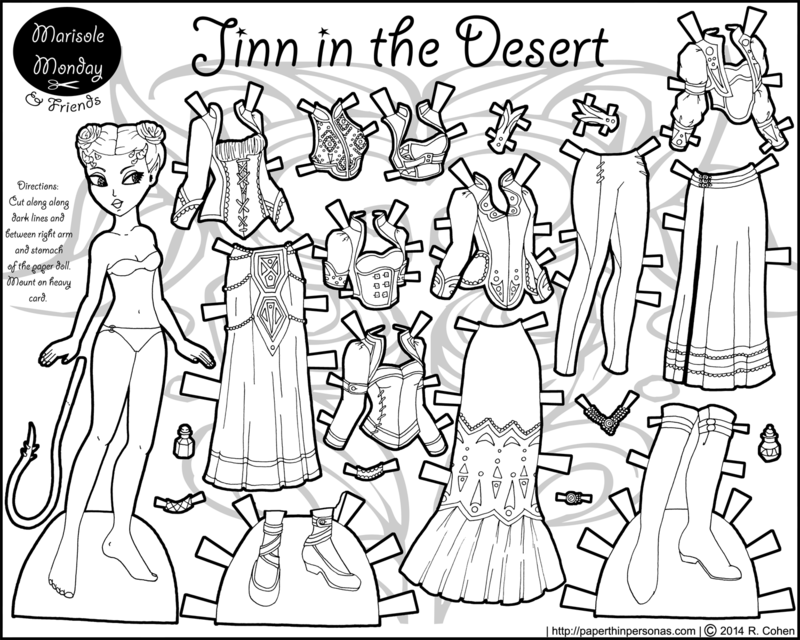 Today’s paper doll was inspired by the Arabic folklore creatures called Jinn (or Genies). According to some sources, Jinn are made up of smokeless fire and scorching heat and they are sentient, like humans and angels. Jinn appear in many fairytales and folktales from the Middle East including the most famous to my readers, I suspect, which is the genie in Aladdin. Though there are some stories of Jinn granting wishes, this doesn’t seem to be something they do outside of fairytales. I decided to give my paper doll a separate tail piece which is meant to be glued to her back once she’s been cut out. I thought it would be easier for the variety of clothing options which you might want to dress her up in. Her clothing has nothing terribly Middle Eastern about it, but that’s neither here nor there. As often happens, the resulting doll has wandered far from the source material. One of the things I really do like about today’s paper doll is the number of outfit options. With seven tops and four bottoms and two pairs of shoes, she’s got over 56 different outfit options and that’s nothing to sneeze at. Oh, and before I forget, I did manage to get my email notices up and running again. If youve already put in your email than you should being receiving a notice when the site updates. If you haven’t gotten a notice and you think you should, please email me (paperthinpersonas (at) gmail (dot) com) and I shall see what I can do. If you want to receive a notice, just type your email into the box on the sidebar and you’ll be added to the list. 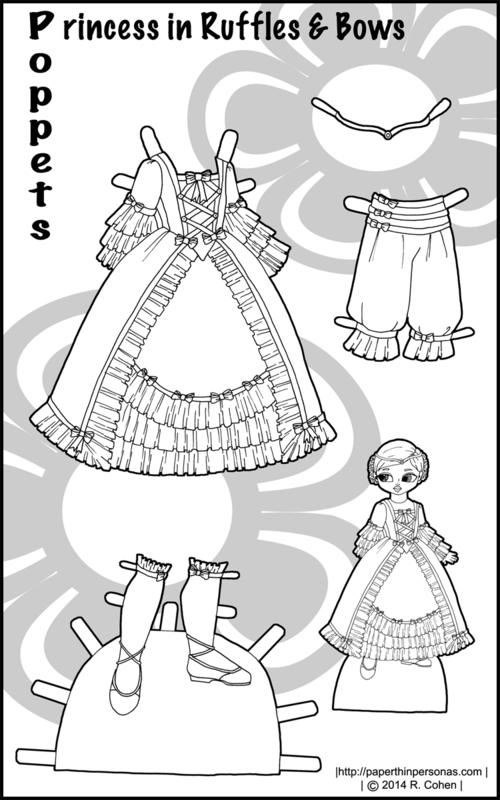 So… I often get asked for more black and white versions to color of Marisole Monday paper dolls. Oddly, I have almost never been asked for black and white versions of other paper dolls, but that’s neither here nor there. 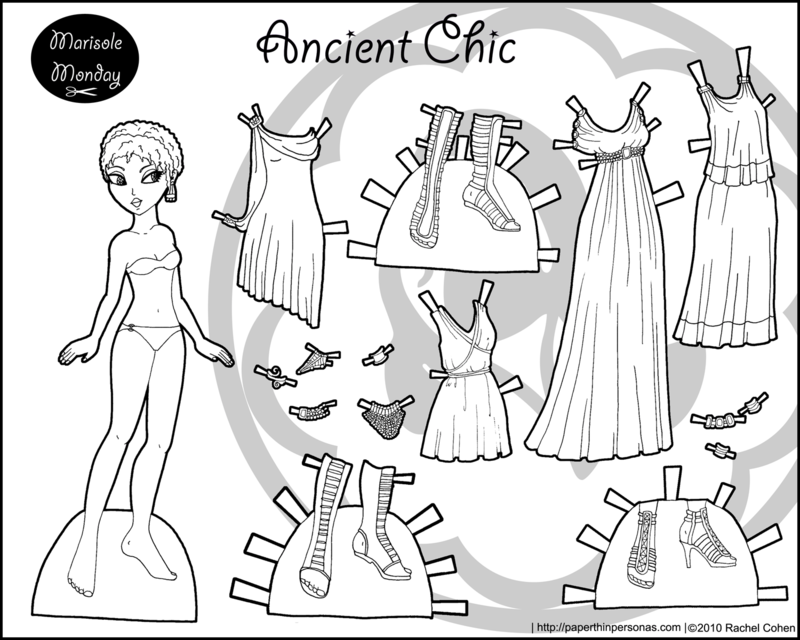 This was specifically requested a while ago, so I wanted to make sure to do Ancient Chic and one of the sets. I forgot that I hadn’t done this in black and white. I would have sworn I had… but as it turned out, I was wrong. 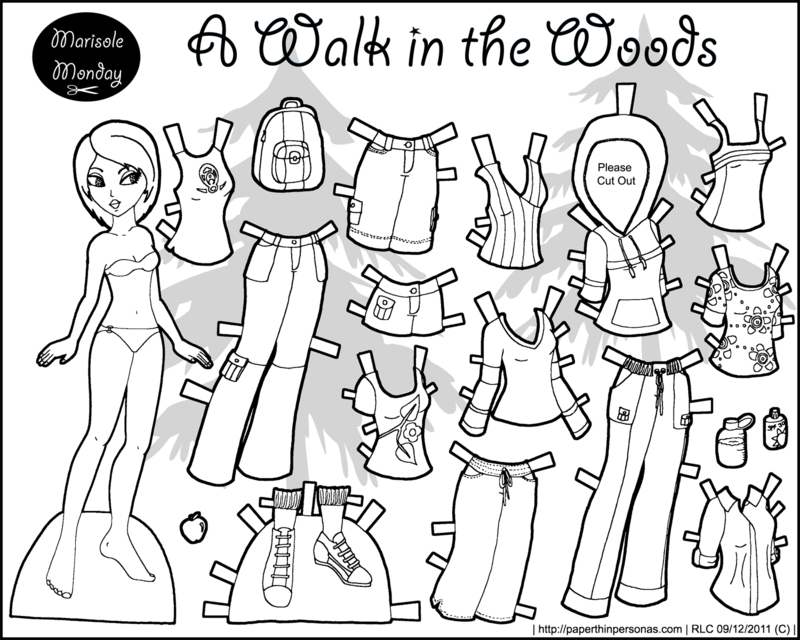 It’s odd to me to think this paper doll set in color was posted nearly two years ago. Wow… That was a while ago. I’m still not pleased with how the floral skirt turned out, but sometimes you just can’t win. Walk in the Woods in color was a set which I wanted to do some more casual wear and as I recall someone had asked for East Indian coloring, so that was my attempt at that. In hind sight, I rather like the accessories with this set like the apple, water bottle and backpack. So, here they are. A few sets in black and white to be colored. Enjoy them everyone.